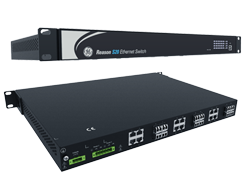 GE’s Reason S20 series of managed Ethernet switches are designed to enable an IEC 61850 digital substation network, including IEEE 1588v2 (PTP), in harsh environments within power systems and industry applications. Using the Reason S20, packet switching between substation devices is flexible, reliable and robust, even in situations where routing is necessary. S2020, the cost-effective choice, offers a high density of Ethernet ports in a 1U form factor for easy rack mounting. This model supports up to 5 modules with 4 ports each and allows configurations with up to 20 fast Ethernet ports or up to 4 gigabit ports plus 16 fast Ethernet ports. S2024, the premium model, offers full gigabit Ethernet switch functionality. This model supports up to 24 ports, provided by 6 interface modules with 4 ports each. The 1U mechanical design is identical to the S2020 model. In both S2020 and S2024 models, layer 3 functions and IEEE 1588v2 PTP (all ports, hardware-based) can be upgraded via a licensing file. The Reason S20 switches can be configured and managed cyber-securely using an SSH command line interface or an HTTPS graphical interface. Both switches support RADIUS and TACACS+ remote authentication technology. Statistical management information can be accessed using SNMP v2/v3. New failsafe function to detect Ethernet port link up/down from each interface separately. New SNMP OIDs to share the equipment Serial Number and internal temperature. Layer 3 functions and IEEE 1588v2 PTP may be upgraded via a licensing file, available for both models S2020 and S2024. The Reason S20 delivers advanced cyber security features that help operators to comply with NERC CIP guidelines and regulations. These features are standard with firmware 06A02 and greater. Efficiently administrate users and their privileges within S20 devices. Multiple users account with independent passwords and privilege levels (roles) may be created, and with an advanced function leveling it is possible to define the access level required for each pre-defined function. Attempts to log-in (either successful or failed) are stored in a persistent flash memory syslog. After three failed log-in attempts, the user account gets locked out and must wait 1 minute to retry new three attempts. Passwords are encrypted using SHA256 and must have at least 8 characters including lower/uppercase alphabetic, numeric and special nonalphabetic (e.g. #, $, @, &). By default, passwords expire after 6 months (user-configurable). To perform a secure firmware update, S20 uses the checksum algorithm to check firmware integrity and a digital signature to ensure its authenticity. In addition, only the encrypted Secure File Transfer Protocol (SFTP) is enabled to transfer the firmware file. By default, only secure protocols such as SSH (CLI) and HTTPS (graphic web interface) are activated to establish remote access to S20, and if desired they may be disactivated as well as unused Ethernet ports, leaving only the local USB Serial communication through SSH available. The flexible design of Reason S20 allows the user to customize each group of 4 ports interfaces to either electrical (RJ45 fixed/SFP) or optical (SFP), Fast Ethernet or Gigabit. In addition, S20 may have a redundant power supply which does not need to be identical to the main one. The power supply options are the full range high voltage 100-250 VDC / 110-240 VAC (50/60 Hz) or the low voltage 24/48 VDC. Field proven design backed by extensive type testing to ensure the robustness of the S20’s fanless design for harsh substation environments. The EMC and Environmental tests are in accordance with IEC 60255-26 and safety requirements in accordance with IEC 60255-27 and IEC 61010-1. The Reason S20 is compliant with IEC 61850 for applications in substations, proven by a functional and performance test report issued by KEMA. The test scope included VLAN function, QoS function for GOOSE messages, network recovery performance (RSTP) and booting time. The Reason S20 UltraRSTP achieves a fault recovery time of less than 5ms per hop, reducing packets loss while maintaining interoperability with others standard RSTP devices. For zero recovery time, S20 is ready for PRP networks schemes. Precision Time Protocol (PTP) is defined in the IEEE 1588 standard, which describes the precision clock synchronization protocol for networked measurement and control systems. Reason S20 complies with IEEE1588v2, and can operate either as transparent clock or boundary clock to ensure time accuracy for PTP-aware IEDs in the network. All S20 interface ports may operate as PTP-aware, achieving the nano second accuracy given the hardware based implementation.